Why did I read this? Back in the day when I was attending South Eugene High School the school district had a radio station and some of us got to have a show on the station. I remember playing almost all the cuts from Herbies’ album Headhunters, along with a lot of Dave Mason. When I saw this come through the bookstore I knew I wanted to read this. Herbie chronicles his life through all its various ups and downs. He started playing classical piano when he was 7 and made his concert debut before he was a teenager. As he attended Grinnell college he discovered jazz and has been redefining his music ever since. He got a major push playing with the great Miles Davis, who always encouraged to try different sounds. Herbie is not content to sit on his laurels and continue to make the same record over and over, even if that is what his fans seem to want. His desire is to explore the possibilities of music and the many ways to make. He details his Buddhism, his marriage and even his drug habit. He explores his regrets and his accomplishments. Did I enjoy it? 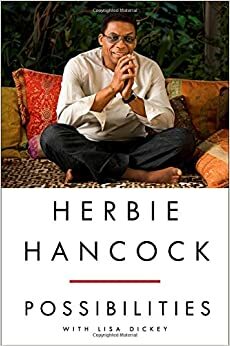 Yes as I fan of Herbie and all his various sounds I was interested in knowing his philosophy of music and why he has done what he has.